A few days ago I caught the end of a story on the NPR program All Things Considered. Apparently there's been some confusion about the North Carolina/South Carolina state line. You can probably imagine the bureaucratic nightmare of having your home or business in a different jurisdiction than you thought. The five second transition after the story is what caught my attention: a music clip of the Robin Thicke song Blurred Lines. See? The story is about lines and they aren't clear … which is another way to say blurred? Genius. My dream job is to be the NPR music person—not doing stories about celebrities or albums. I just want to be in charge of the sneaky snippets of music serving as an inside joke if you can place the song and figure out it's connection to the story. When done well, these brief moments elevate my enjoyment of a piece to a whole new level. The one I already have, teaching community college without dealing with politics, but in my fantasy there's an entirely different pay structure involved. Back-up dancer for a big concert act. Researcher, primarily for a quirky billionaire with flexible deadlines. And you? 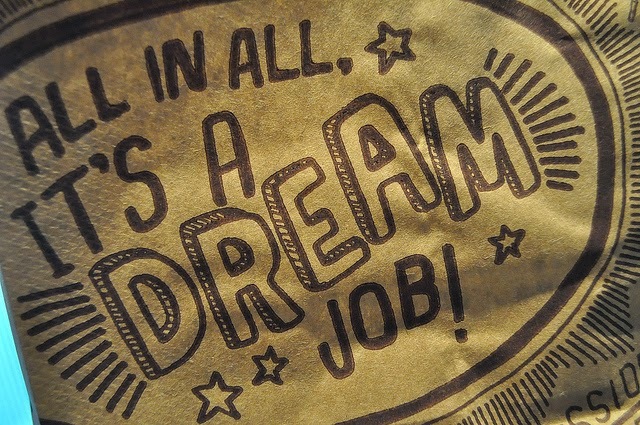 What's your dream job? *It goes without saying that if you have influence regarding hiring for any of my dream jobs, I fully expect you to pull some strings for me. Eliana Osborn was raised on cold weather and wild animals in Anchorage, Alaska, setting the stage for her adult life in the Sunniest Place on Earth in Arizona. She grew up in the church and didn't know there were places where conformity was preached. She has degrees. She writes. She teaches. She has some kids. She even has a husband. She's trying to do her best. Image credit: Atsuke (used with permission).